Kitchen! Kitchen! 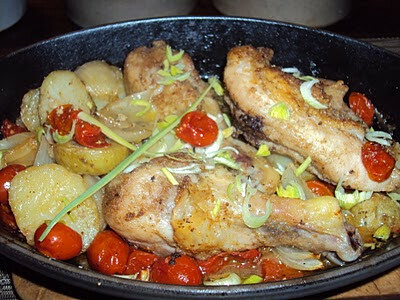 : roasted chicken... a one pot meal....at kitchen! kitchen! roasted chicken... a one pot meal....at kitchen! kitchen! After an hour in the oven comes this wonderfully roasted one pot chicken meal. In a medium size oven proofed pan gather together all the ingredients and season with salt, and pepper. Sprinkle some olive oil and toss making sure that all the inredrients are coated with olive oil, Add the chiken on top of the potatoes and bake at 350 F for 50-1 hr. until golden. Serve and garnish with scallions. It is sim ply easy and delicious......EASY is good!